It's just about 2:35 AM right now--crazy, right? The techy person (my daughter) at Boojiboo decided to move the blog over to wordpress.com. Supposedly the dashboard organization is better. What that means, I do not know. But I trust her... or rather, I have no choice. I did notice it has a cool navigation strip at the top, and now we can reply individually to your comments! Sidenote--we do read each and every one of your comments. We just haven't found an effective way to reply to them--but now we have, so yay! This blog and everything here will remain, but no updates after this one at this location! So make sure to book mark the new blog! All the posts and comments on this blog have also been transferred/copied to the new one. *note, it is BOOJIBOO.wordpress.com, no "ILOVE" in the front! This weekend was certainly an eventful one! We needed some totes that our customers could use over and over again, compared to the plastic ones we're used to handing out at shows. So we decided to make some simple totes! My son helped screen print the images, and my daughters will be sewing up the bags. We can proudly say we made all of them ourselves, from start to finish! Here we have all the pieces cut out... took us all night! And the printing begins! At first we laid the pieces out on the table to dry, as the lines that ran across the ceiling weren't hung up yet...we ran out of room though, so we were all scrambling around like chickens with our heads cut off. Here's a picture from under the clothes lines--Much better! They were running back and forth across our studio. After those were dried, the pink heart was ready to go on! 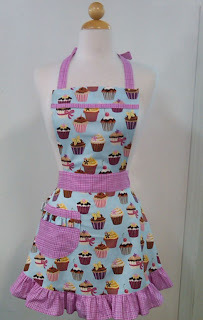 We have another apron giveaway for you guys! Lis over at A Trucker's Wife was kind enough to host one, so click here to enter. You have until August 3rd! 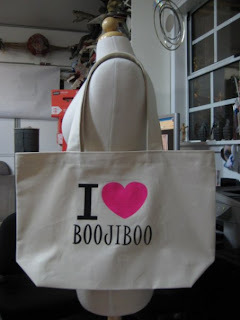 The boojibootique giveaway is still going on, so enter if you haven't already!!! 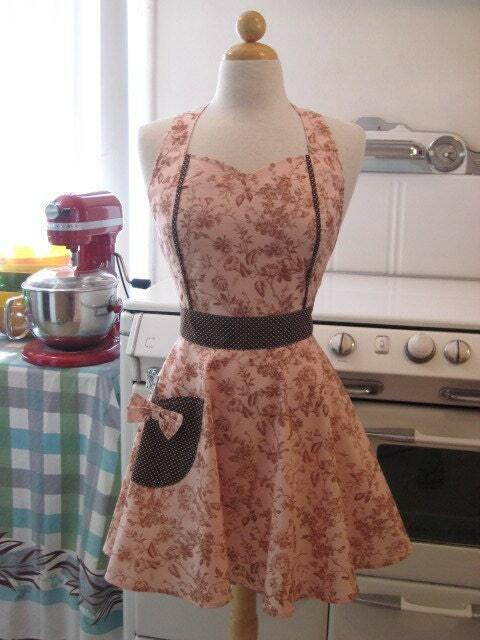 May I introduce to you, The Mimi Petite apron! This apron is aimed towards those who are from sizes 0 to 6. It's very unlike the typical boojiboo apron as it has a FLAT bib. It has a ruffle around the bottom of the skirt and even on the pocket! The apron itself is a few inches smaller than our other aprons. We might tweak it a bit, but so far this is what we got! This is the prototype we settled with, we have another one with a scalloped edge and a few others where the bib has a different shape. We made it to the front page of etsy! Granted, it's from February and it's not like we were featured, but we never even knew. How exciting! And remember that new apron style I mentioned? It will be debuting on Monday... maybe Sunday evening. MAYBE. We're quite excited about this new style, we think it will appeal to more people than before...a new target audience! It will also fulfill a lot of people's requests. 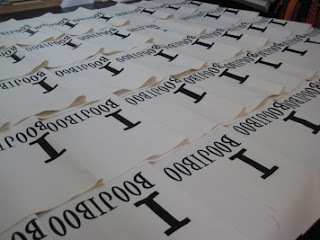 A boojiboo apron giveaway should be happening some time next week. As always, i will post about it. But just a little heads up! Also, we will be doing the Las Vegas Harvest Festival from August 28 to 30th. The Harvest Festival is always one of our favorite shows, especially this one! Stop by and say hi if you are in the area, it's always nice to meet our customers! It has been quite a dangerous week for Boojiboo! While sewing the other day, I hit a seam with many layers and my needle actually split, sending one chunk towards my eye. It's a good thing I have cat-like reflexes. Then today while cutting fabric, I cut an electrical cord! Sparks flew everywhere, and the studio blacked out. We were without electricity for about ten minutes. My blade now has hole in it, and my electrical cord is cut in half... It even melted the blade a wee bit! It's 2:32 AM right now but wanted to let you all know that a new apron style is in the works, so look for it in the coming weeks! I was taking pictures of new aprons (fabric/style combinations) for 4 hours! I will be slowly listing them in our shop. There are some new fabrics, but mostly they are ones you may have seen before but in a different apron style. One of the new fabrics we were lucky enough to find is a beautiful pink and brown toile. Here it is in the Maggie style. Purty isn't it?